I've been training for the London Marathon and bought a Garmin Forerunner 305 GPS to monitor my progress and hopefully motivate me to push that bit harder. The GPS device itself is great and manages to find satellites fairly quickly (about a minute, slightly longer in very built-up areas) when outside and track them without losing signal thereafter. The Garmin Training Center (I was running GTC v3.4.3) however is shocking; my only assumption is that Garmin wanted to keep the cost down so invested everything into the device and let their users find alternative software. Kind of makes sense I guess when there's some good stuff out there for free. 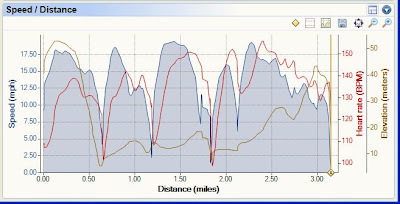 I spent a fair bit of time looking at web-based and desktop alternatives to Garmin Training Center and SportTracks is the best I found. 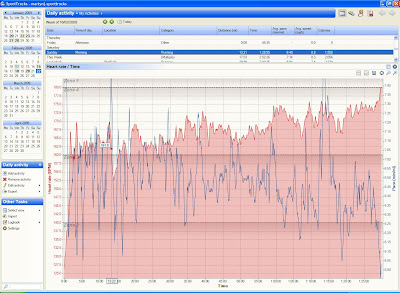 SportTracks is free software for charting, mapping and archiving training data from GPS sessions. It'll differentiate between cycling, running and other activities, plot your speed over time or distance, superimpose on Google Maps, export in KML and GPX, all the functionality that I, for one, want. Initially Windows-only, SportTracks is now available [this post updated early 2010] in an experimental download for Unix/Linux, and potentially Mac OS X if the latest Mono release for OSX supports it. 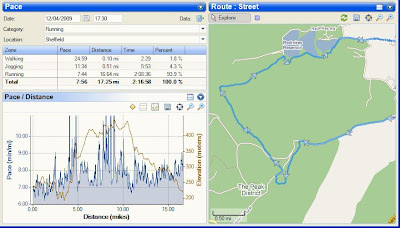 Having installed SportTracks, you can do away with Garmin Training Center altogether, but will need to manually delete your running history from the GPS every so often (GTC does that from your PC, but SportTracks up to v2.1 does not).